The Portland Chair officially becomes our BESTSELLER. 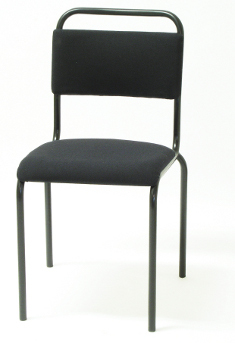 This ultra-reliable, stackable musicians' chair has become a favourite with professionals and amateurs alike. From concert auditoriums to parish halls, these chairs have proved to be a valuable asset. 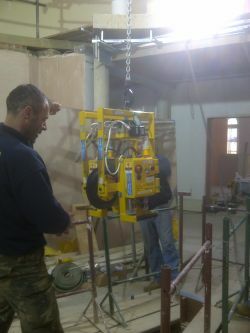 Completion of our trickiest installation yet! This installation of our Studio Mirrors & Ballet Barres required the use of a specialist crane and hoist to lift our Studio Mirrors (one by one) outside over the roof, through hole of the atrium down two floors into the indoor swimming pool (it was empty!). Once detached from the hoist, the mirrors were carried through and installed in the gym of this exclusive house in Hampshire. Our thanks to Pete and his wife for the copious cups of tea served to our team during this difficult, but extremely successful installation. Not one scratch or breakage occurred. We await the next challenge! 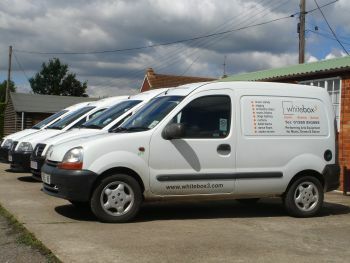 New Whitebox3 Van joins fleet! We're just thrilled with the new graphics and have already been spotted on the roads by customers. NEW SCENA STAGE SYSTEM from WHITEBOX3. Setting up the stage is no longer a chore - it's just great fun with the Scena Stage System. No tools needed, sets up in minutes and it's strong (very strong). Great for primary schools, secondary, university - everyone! Whatever your requirement for a sturdy stage, Scena will perform, time and again. NEW Hand-Crafted Wood Music Stands exclusive to Whitebox3 - see our Concert Music Stands page for details. Stunning designs available in a range of wood finishes and crafted to the highest specification. Quite simply, a very special gift for any musician and a beautiful feature in any home. Prima Stage School choose Whitebox3's ActiSprung Dance Floor System and wall mounted ballet barres for their two studios. Caldicott School care so much about the posture of their musicians, they purchased the Whitebox3 Musician Chair with built-in lumbar pad. Clapton High School for Girls boast a massive run of ballet barre: 18m in length! 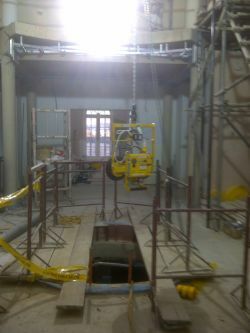 Performa Stage System reaches new heights at East Barnet School. A large selection of Performa platforms and leg sets create versatility for whatever production is being performed. From flat stage to tiered risers, Performa Staging can take it. Castle Douglas High School. Studio Mirrors & Curtains were required to convert gym area to an area that could be used for dance. Principal Sheelagh Rusby was "thrilled to bits" with the results. Repton School choose Whitebox3 Musician Chair. Selected for it's unique built-in lumbar support, the orchestra now play in comfort. Stacking Harmony Stand from Manhasset. Store 25 stands in just 1.8m of space or 50 stands in only 3m (linear). The Harmony Stand boasts amongst its features: a virtually unbreakable ABS plastic desk, Manhasset's time-proven "Magic Finger Clutch" height adjustment (no knobs/screws) and a unique V-shaped base for unlimited stacking. Wall Stand from Manhasset . A uniquely designed wall mounted music stand , ideal for music practice rooms or areas where floor-space is at a premium! Manhasset increase product warranty from an already impressive 5 to a massive TEN (10) YEARS on all their music stands. The Manhasset Speciality Company have increased the warranty period on all of their music stands unconditionally against defects in materials and workmanship to 10 years from the origiinal date of purchase. There is no fine print. If there are any problems or issues related to Manhasset products or their warranty, please call us. Whitebox3 Appointed Exclusive UK Representative for Wilde & Spieth! Imagine our delight at being entrusted with the responsibility of bringing Wilde & Spieth's superbly designed range of orchestra chairs to the UK. Thomas Gerber of Wilde & Spieth says, "We have waited a long time for the UK to discover our specialist range of orchestra chairs and we are delighted to be working with Whitebox3. We are well aware that 'the proof is often in the pudding' and we welcome any musician, orchestra or concert venue to contact Whitebox3 and arrange to try our chairs". Wilde & Spieth offer specialist designs for the entire orchestra including Conductor, cellist, harpist, percussionist, pianist and bass player. All musician chairs feature a position-tilting seat which offers lumber vertabra support and raises the pelvis to direct and facilitate circulation in the legs, not to mention the seats are of pure rubber fibre (natural latex) that maintains its shape - even after long periods of intensive use! Bespoke Instrument Storage Racks & Cabinets for Hull Music Service. Hull Music Service moved into their brand new Albemarle Music Centre equipped with bespoke instrument racks created by Whitebox3. Not wanting to waste any precious space, Chris Maynard (Head of the Music Service) worked closely with Whitebox3 to create a space-saving system of double and triple height storage racks, making full use of the height of the rooms for their vast collection of cellos and violins/violas. Included in this was the creation of a series of string bass racks to fit a curved wall! Whitebox3 also provided bespoke, lockable storage cabinets for their percussive equipment and general storage together with our sliding Library System for storing their vast quantities of sheet music! See the photos on the website - or ask for details. Performa Staging Gallore! Our superb easy to set-up/take down Performa Stage System has been the number one choice for many new schools. St Matthews Academy purchased one stage set for their primary children and then another set for the seniors. Venue Chairs & Manhasset Stands for Warwick School. Not content with the one set of Venue chairs purchased last year, Warwick School ordered a second set this year! Of course, they couldn't pass up the chance to own a few Manhasset music stands too. Dance Equipment for Samworth Academy. Mirrors and the superb DuoBarre grace dance studio at new Academy. Music Stand Banners for Eastwood School. Not one, but two sets of attractively embroidered banners: one for the orchestra and one for the band. They really are more affordable than you think! One price only, you supply the artwork and we'll do the rest. There are no hidden or additional charges. Sample Product Available. Whilst we like to think we are a genuinely honest team at Whitebox3, we wouldn't expect you to take our word for how great our products are. So, why not see for yourself? We would be delighted to show you sample products at your request. Do just call and ask. King's College London Dance Society chose mobile mirror units for an instant wall of mirror. (The mirror units nest together when not in use taking up minimum storage space). BBC National Orchestra of Wales finally see the light! Well, rather a lot of them - a set of music stand lights for the entire orchestra in fact! Urgent Call from Croydon College sees large quantity of ballet barre brackets and wooden barres leave Whitebox3 in a hurry! A ready supply is always available. Sacred Heart School chose blue choir folders printed with school logo in silver. An attractive addition to any choir (orchestra folders available too). Biddulph School can't see enough of it's students! At least this is the case with the addition of new dance studio mirrors. We could of course keep going with the list, but hope this helps give you an overview of just what we do. We hope we can help you too.